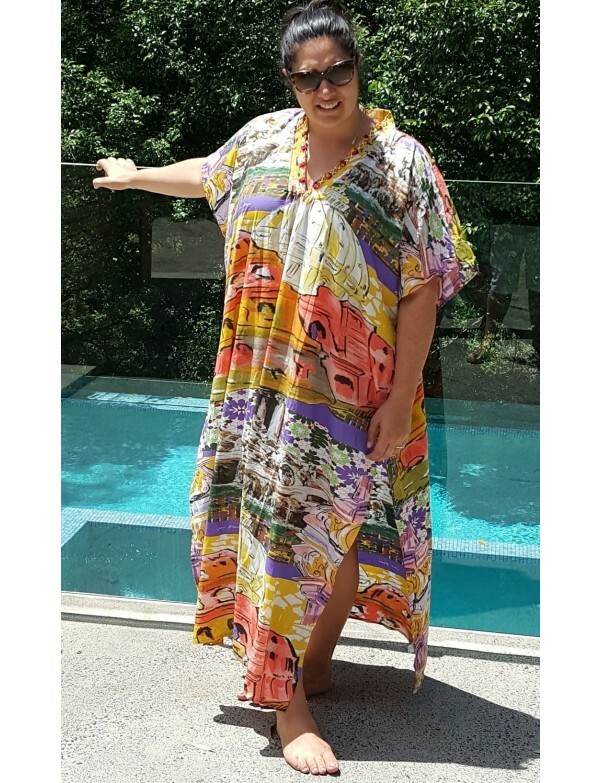 It’s an endless tropical passion with the Riomaggiore Kaftan by Antica Sartoria Positano. This maxi kaftan puts together multifaceted, intricate and colorful patterns, adorned with a beaded deep neckline. Perfect as a beach cover up or paired with pants for an everyday statement piece.Ideal in the daytime for the beach look, or a walk along the seafront. Light, cool and above all comfortable, without closures, zippers or buttons, the caftan slips quickly from the head, but at the same time gives elegance and charm to the wearer, allowing you to face the hot summer days with class and charm. Throw it in over your bikini, pair it with your oversized bag, and hit the shores and the street this summer in this number.